Barcelona pulled 10 points clear at the top of the Spanish La Liga thanks to a 4-1 victory away to Real Betis on Sunday. Lionel Messi continued his impressive form this campaign, scoring a hattrick while Luis Suarez got the other goal. 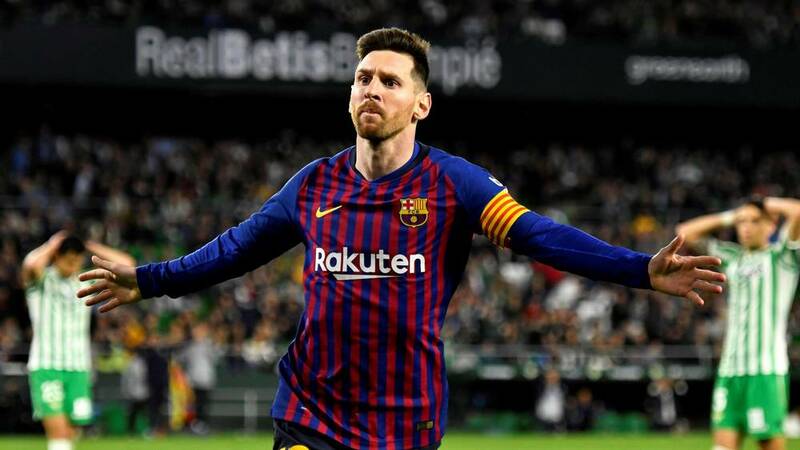 Loren Moron scored Betis consolation on a night that the Estadio Benito Villamarin gave Messi a standing ovation straight after completing his treble. The victory sees Barca move onto 66 points for the season, having won 20, drawn 6 and lost only two of their 28 games so far. For second placed Atletico, their chances of winning a second League title in five years were all but shuttered as they lost 2-0 away to Athletic Bilbao on Saturday. The 2013/14 champions struggled throughout the first 70 minutes and were eventually punished with 13 minutes to play as Inaki Williams put Bilbao ahead. Simone’s side looked to have woken up but the home side landed a sucker punch with 5 minutes to play as Kenan Kodro scored a second. Atletico now remain on 56 points, 10 behind leader Barcelona with just 10 games to play. In Madrid, Zinedin Zidane got off to a winning return as Madrid coach, defeating relegation threatened Celta Vigo 2-0 at the Bernabue. After a goalless first half, Real took the lead on 62 minutes through Isco. Gareth Bale added a second 15 minutes later to seal the victory. This is Real’s 17th win of the current campaign and it sees them remain third, two points behind Atletico. Elsewhere, the battle for the fourth and final champions league spot intensified with 4th placed Getafe and Valencia (7th) drawing 0-0 at the Mestalla while Deportivo Alaves (5th) and Sevilla (6th) both won their respective fixtures. Alaves were 3-1 winners at Huesca while Sevilla defeated Espanyol 1-0. Only six points are the difference between Getafe and Valencia. Also on the weekend, Villarreal, Valladolid and Girona were the other winners. The Yellow Submarine made it two wins on the trot as they defeated Real Vallecano 3-1, Valladolid were 2-1 winners away to Eibar while Girona powered past Leganes 2-0. 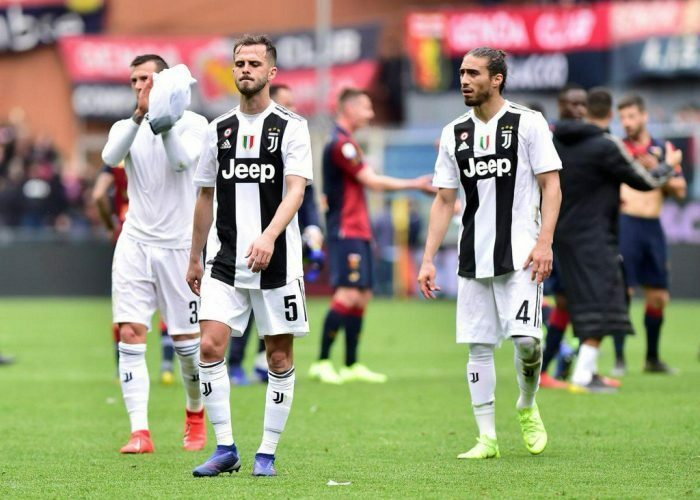 In Italy, Juventus were subjected to a first loss of the season as they went down 2-0 away to Genoa. With star-player-Cristiano Ronaldo rested, the Old Lady paid dearly, ending a 27 game unbeaten run since the start of the season. Both of Genoa’s goals came in the second half with Stefano Sturaro scoring the first on 72 minutes and Goran Pandev adding the second 9 minutes later. The loss means Juve are now 15 points ahead of Napoli in the race for this year’s Scudetto, with just 10 games to play. For Napoli, they were 4-2 winners at home to Udinese. Amin Younes, Arkadiusz Milik, Jose Callejon and Dries Mertens were all on target for Carlo Anchelloti’s side while Kevin Lasagna and Seko Fofana scored for the visitors. Victory for Napoli means they reduce Juve’s lead at the top to 15 points after 28 games. In the Milan derby, Inter defeated AC 3-2 at the San Siro to return into third on the standings. Inter raced into a 2-0 lead by the 51st minute thanks to Matias Vecino and Stefan de Vrij’s goals. AC pulled one back through Tiemeuo Bakayoko but Lauturo Martinez struck from the spot on 67 minutes to restore Inter’s 2 goal caution. Mateo Musacchio scored a second for AC late on but could not stop Genaro Gattuso’s side from losing in the end. Luciano Spalleti’s side retain 3rd spot on the standings with 53 points while AC are now 4th, two points behind Inter. In the race for other European spots, Roma lost 2-1 at SPAL, Lazio defeated Parma 4-1 while Atalanta were held to a 1-1 draw at home to bottom side Cheivo. Elsewhere, Sampdoria, Cagliari, Bologna and Empoli also registered victories in their respective fixture. In France, PSG edged closer to another League title, dispatching 10 man Marseille 3-1 at the Parc de Princes on Sunday. The Parisians who were still without the injured Naymer and Edison Cavani took the lead through teenage sensation Kylian Mbappe on 45 minutes but Marseille responded a minute into the second half off Valeri Germain’s strike. Angel Di Maria scored twice in the second half that also saw Marseille captain Steve Mandanda sent off for handling outside his area and Mbappe missing a penalty in the dying minutes of the game. The three points mean PSG now move to 77 points for the season having won 25, drawn 2 and lost only one of their 28 games so far. Lille who occupy send on the table, lost their weekend’s game 1-0 at home to a resurgent Monaco. Calros Vinicius scored the game’s only goal in the 90th minute after both sides had proved to be wasteful in front of goal throughout the first 89 minutes. Despite the loss, Lille remain second with 57 points, 20 behind PSG. In Lyon, home side Olympique Lyon fought hard to defeat Montpellier 3-2 on Sunday. Batrand Traore, Martin Terrir and Houssem Aouer scored for Lyon while Florent Mollet and Souleymane Camera struck for the visitors. Lyon move to within four points of second placed Lille, six ahead of Marseille who are fourth. Saint Etienne and Reims also continued their push for a European position with comprehensive victories in their weekend’s fixtures. Etienne defeated Caen 5-0 while Reims were 1-0 winners over Nantes. Elsewhere, only Guingamp were victorious in the bottom three as they defeated Dijon 1-0 at home. In Germany, the top two of Bayern Munich and Dortmund were victorious in their games this past weekend. Bayern trounced Mainz 6-0 withe James Rodriguez scoring a hattrick while Dortmund required a late Marco Reus strike to overcome Hertha Berlin 3-2 away from home. The two remain locked at 60 points apiece at the top of the Bundesliga with only 8 games to play. In the battle for the other two final Champions League spots, third placed Leipzig defeated Schalke 04 1-0, Monchengladbach (4th) were held to a 1-1 draw at home to Freiburg while fifth placed Frankfurt defeated Nuremberg 1-0. Leipzig now have 49 points, Gladbach are on 47 while Frankfurt have 46. For 6th placed Bayer leverkusen, they were defeated 3-1 at home to Werder Bremen (8th) while Wolfsburg (7th) were 5-2 winners over Fortuna Dusseldorf. Elsewhere, only Augsburg who defeated Hannover 96 3-1 were the only winners in the bottom half of the Bundesliga.